Forged tips create a stronger and more flexible torsion zone, reducing breakage and extending bit life. Hardened cores increase bit strength and reduce fracturing. Ideal for fast, easy driving of nuts, bolts and hex head screws. Rugged single piece construction. Long life under constant use. 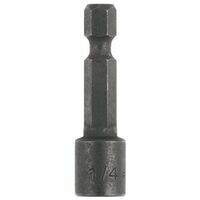 Precision formed tip ensures proper fit. 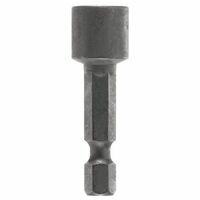 For power driving hex head screws, bolts and nuts. Design reduces rounding of the hex. Advanced hardening process provides max. durability. Extra strength magnets provide strong bit retention. Standard hex shank fits most power drill chucks. 1-7/16'' long. Lobular nutsetters are built for maximum durability, performance and long life with impact tools. Designed to drive the fastener from the side, rather than forcing the corners to turn, maintaining the true shape of the fastener and dramatically reducing breakage and damage from stripping. Also provides more clearance on the corners of the fastener where paint build-up often occurs. Black oxide finish resists corrosion to increase the life of the nutsetter.